Adobe has changed a lot about the look and feel of Photoshop Elements 14, and it looks strikingly like the new Apple Photos app for the Mac. For starters, the new interface showcases your photos and video together, rather than showing them separately as it was in Photoshop Elements 13. The new version of Elements also does a much better job of grouping photos based on events and the people tagged in them. For example, hovering the cursor over someone's name will find all of the images that they're found within. Additionally, if you want to find out where you took a photo, Elements 14 will present you with a map. Events view, meanwhile, will automatically group photos into a combined calendar view. Aside from the new look, Elements 14 adds a new guided edit mode, which will point out what could be improved in the photo for you, including framing and correcting skin tones. 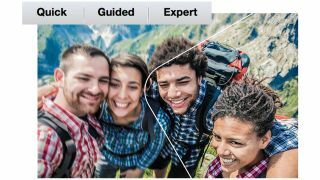 Other enhancements include automatic haze removal and improved automatic camera shake correction. Photoshop novices will also appreciate the newly improved refine selection tool, which makes it especially easy to select a subject with hair. What about Adobe Premiere Elements 14? Adobe also announced a new version of Premiere Elements 14, with a major focus on audio editing. The new video editing software package now includes a new audio view that shows the audio track in .wav format. Filmmakers also get a set of audio tools, including the ability to mix or add narration as well as effects such as low and high pass filters. Motion Tiles (a completely new feature), meanwhile, will allow videographers to add an animated video tile on top of their footage – think picture-in-picture. Black and White video has trickled down from the Photoshop Creative Cloud package to Elements 14, and you'll even be able to add slow and fast motion with the Timezone feature. And lastly, you'll be able to import and export 4K footage. Adobe plans to launch both Photoshop Elements 14 and Premiere Elements 14 before the end of the year for $99 (£64, AU$99) each. We'll be sure to tell you whether the former is worth the price of admission in our forthcoming review.